The article describes the backup in the case that you are using POP3 or IMAP email account. If you are using Microsoft Exchange, you don't need to back it up. All data are saved on the Microsoft Exchange Server. The restoration of personal folders is also related to the restoration of tasks relations between Microsoft Outlook and eWay-CRM. 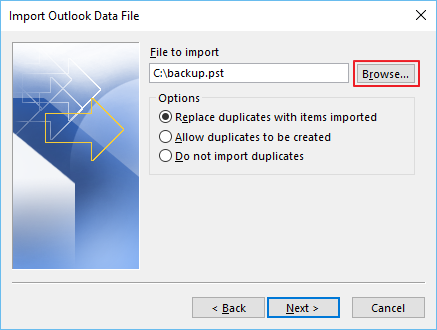 Activate the guide for the export of items using Microsoft Outlook menu/ribbon (File > Import and export... or File > Open & Export > Import & Export in newer versions of Microsoft Outlook). As soon as click the Finish button, the backup will be saved to the specified path. Remember this location, you will need it during import. If you proceed the restoration on other computer, you will need to copy the backup file. The first step of the restoration must be creating the new profile in Microsoft Outlook with the same email address that was set previously. When this step is done, open Microsoft Outlook with new profile and, again, activate the Import/Export guide. If you click Finish, your personal folders will be imported to the new profile in Microsoft Outlook.